The Healthy Living Centre aims to improve the health and wellbeing of people living and working in Buckinghamshire. Spaces are available for funded and fee paying children aged between 2-5 years. Healthy Living Bucks is a community-led service, aiming to build opportunities that support the development of individuals and groups in Buckinghamshire. We believe in fairness, respect, support and an open and honest approach. We all live side by side, but it is only when we come together that we really get to know each other and form a true community. As a community, we can support each other, share ideas and make friends. We can take part in new activities and discover things we never knew we were good at. Community spirit makes everyday life easier and more enjoyable for everyone. By working as a group, we believe we can all gain the confidence, skills and strength to live a fuller life. We can achieve so much more when we are in good health. As such, The Healthy Living Bucks is passionate about encouraging everyone in our community to eat well, get active and gain a positive outlook in fun ways. We offer an extensive range of activities for all age groups and would love to welcome you along. What would you like to see in your community? We’re actively developing our services and welcome your suggestions. If you have any questions, feel free to give us a call on 01296 334562 or email info@healthylivingcentre.com. Our friendly staff are happy to provide you with the information you need. 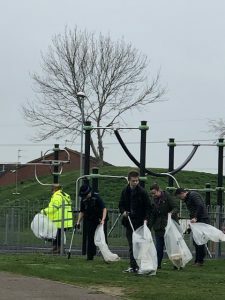 The parks and green spaces around The Healthy Living Centre had a Spring Clean on Friday 22 March. Thank you to everyone who got involved! English as a Second Language? We can help! Our cafe remains closed, but you are welcome to bring a drink and snack, your paper or your craft project and relax in the cafe space. Meet up with friends, get out of the house and join us. The Healthy Living Centre is looking to attract new members to the team. Put your skills to good use and support your community. See the full job description on our Jobs page. Every Thursday – Storytime & Song 1.30 – 2.00pm – No charge, just come and join in. Why not stay for a chat with other parents after? SATURDAY 6 APRIL – Cancer Awareness Family Fun Day. Craft stalls, activities and refreshments. All welcome. NEW ACTIVITIES FOR 2019: Relax Kids, Children’s Karate, Tots Ballet & Tap, Disco & Rock ‘n’ Roll Dancing, Yoga, Qigong, Zumba Strong, Enrych Arts & Crafts – pop into the centre to find out more!! Bucks County Council; Aylesbury Vale District Council; Aylesbury Town Council; Vale of Aylesbury Housing Trust; Adviza; Building Futures.